Chrysippus of Soli (c. 280 B.C.E. - c. 207 B.C.E.) is considered to be a co-founder of Stoicism, one of the most influential schools of Hellenistic philosophy. He succeeded Zeno of Citium and Cleanthes as head of the original school in Athens. He is said to have written over 700 works, none of which have survived except as fragments embedded in the works of later writers. Chrysippus is credited with developing Stoicism into a logical, systematic thought. He was one of the first to organize propositional logic as an intellectual discipline. Due to his theoretical contributions to the formation of Stoicism, it was said that, "If there had been no Chrysippus, there would have been no Stoicism." Chrysippus was born in 280 B.C.E. in Soli, Cilicia, Asia Minor (now Soloi, Turkey). According to Diogenes Laertes his father was named Apollonius. After losing a large inheritance through a legal controversy, he became seriously interested in philosophy. He came to Athens to study philosophy at the Academy with Arcesilaus and Lacydes, and there he apparently learned the technique of arguing both sides of a question and first considered concepts of magnitude and quantity. He then became a student of Cleanthes of Assos at the school founded by Zeno of Citium at the Stoa Poikile (Painted Porch). Upon Cleanthes’ death in 232 B.C.E., Chrysippus became the head of the school and remained in that position until his death in 206 B.C.E. By then, all the major tenets of Stoicism were in place, and Chrysippus is credited with developing, organizing and strengthening the arguments originally proposed by Zeno. Chrysippus wrote over 700 papyrus scrolls. As was apparently common with natives of Soli (Soloi in Turkey), his style of writing in Greek was awkward. An old woman who lived with Chrysippus reported that he wrote 500 lines every day. Apparently he sometimes wrote several books on the same subject, putting down all of his thoughts on the matter, correcting himself, quoting long passages from other philosophers and adding numerous testimonies. Apollodorus of Athens criticized him in a work, Collection of Dogmas, saying, "For if any one were to take away from the books of Chrysippus all the passages which he quotes from other authors, his paper would be left empty." None of his written works survive except for a few fragments embedded in the works of later writers such as Cicero and Seneca. He was skillful at debate and had a tendency to take both sides of an argument, a habit that frustrated his students and disciples, especially when in the heat of an argument he was led to make ridiculous assertions. Many of Chrysippus’ listeners said that if the gods were philosophers, they would surely debate in the same manner as Chrysippus. From the writings of Chrysippus it is evident that, after his inheritance was confiscated by the government, he was not wealthy and that he relied on income from teaching and the support of friends. Diogenes Laertius’s Lives of the Philosophers contains some interesting anecdotes about the life of Chrysippus which may or may not be completely accurate, but which present him as a strong and outspoken teacher. According to Diogenes, Chrysippus had great natural ability and perspicacity and dissented from Zeno and Cleanthes on numerous points. Before Cleanthes’s death he was already an eminent philosopher in his own right. Apparently he frequently came into conflict with Cleanthes and then repented, and is quoted as often saying: "In most respects I am a happy man; excepting where Cleanthes is concerned; for in that matter I am far from fortunate." Diogenes describes Chrysippus as being “slight in stature’” based on a statue of him in the Ceramicus, and as being arrogant. Once, when he was reproached for not attending the lectures of Ariston, a popular philosopher at the time, he replied, "If I had attended to the multitude I should not have been a philosopher." And once, when he saw a dialectician proposing sophistical fallacies to Cleanthes, he said, "Cease to drag that old man from more important business, and propose these questions to us who are young." Diogenes says that he had so high an opinion of himself, that when a man asked him to recommend a teacher for his son, he said "To me, for if I thought that there was any one better than myself, I would have gone to him to teach me philosophy." He sent for his sisters’ sons, Aristocrea and Philocrates, and educated them; and he was said to have been the first person who ventured to hold a school in the open air in the Lyceum. Diogenes gives two accounts of the death of Chrysippus at the age of 73. One states that his death was caused by drinking over-proof wine at a sacrificial ceremony, to which some students had invited him. Another account, which is probably more anecdote than truth, is that Chrysippus, amused when he saw his donkey eating some figs, asked a servant to give the donkey wine as well and died of laughter at the sight. Together with Zeno of Citium, Chrysippus is considered a founder of the Stoic school of Hellenistic philosophy. Though only fragments of Chrysippus' original works survive in the writings of later Stoics and their critics, he is considered to have developed and organized the major principles of Stoicism, based on the propositions put forth by Zeno of Citium. Chrysippus was one of the first to organize propositional logic as an intellectual discipline, allowing the Stoics to make major advances in mathematics and science. The logical term "disjunction" is credited to the Stoics and it is thought to have originated with Chrysippus. Diogenes Laertius lists 118 works on logic by Chrysippus, including seven books concerning the Liar Paradox. 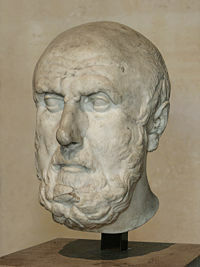 Chrysippus believed that the study of physics and logic was necessary in order to formulate a correct system of ethics. Chrysippus taught that the world was imbued with divine reason, or logos, which directed and shaped everything in the physical world. Each corporeal thing had an invisible character that gave it a distinct form and existence. Qualities of the soul, such as righteousness, were part of this invisible character. Virtue was good; vice was evil. Our ultimate goal was to “live in accordance with nature.” Chrysippus asserted that nobility was not a status assumed at birth due to parentage, but could be achieved only through the demonstration of virtue, since all men come from the same divine origin. Every individual should strive fervently to attain a level of altruism and goodwill towards society, in order to maintain a good balance of the social order. For Chrysippus, hero-worship and praise was not an attractive feature in an individual; humanitas (sympathy, reason, and intelligence) were far more important qualities. He also taught that evil was interdependent with its counterpart, goodness: "There could be no justice, unless there were also injustice; no courage, unless there were cowardice; no truth, unless there were falsehood." An old saying emphasizes Chrysippus’ importance to Stoicism: "... He (Chrysippus) alone is the sage, the others only act as shadows." Brehier, E. Chrysippe et l'ancien stoicisme Paris, 1951. Edwards, P. (ed.). 1967. “Stoicism.” The Encyclopedia of Philosophy, vol. 8. MacMillan, Inc: 19-22. Hahm, D. E. 1972. “Chrysippus' Solution to the Democritean Dilemma of the Cone.” Isis 63 (217): 205-220. Heath, T. L. 1921. A History of Greek Mathematics, 2 Vols. Oxford. Ide, H. A. 1992. “Chrysippus's response to Diodorus's master argument.” Hist. Philos. Logic 13 (2): 133-148. Sedley, D. 1998. “Chrysippus” in E. Craig (ed. ), Routledge Encyclopedia of Philosophy, vol. 2. London, 1998: 346-347. This page was last modified on 21 February 2017, at 16:07.